The battery pack takes up a huge amount of space in the trunk of the Focus EV - luckily the trunk was big to begin with, and now it has a small trunk. This is the big disadvantage in a EV "re-fit". They had to sacrifice the trunk for batteries. I seldom need any trunk space, so this is not an important factor for me, but it will be for some. Looking for access to the Focus EV! Also, it should make it easier to work on or replace the batteries if needed. That's a good point - it would make it much easier to replace the batteries, they're just underneath a cover in the trunk of the Ford Focus Electric. Another thing Ford has to be careful with is the suspension - there is way more weight on that rear axle than the chassis and suspension was originally designed for. I hope they can make up for it with redesigned springs/shocks! Just another though - will there be a 2 door Ford Focus Electric? If so then it will have even less space in the trunk because they don't have a back seat to put the rest of the batteries under? According to Sherif Marakby (director of Ford’s electrification programs and engineering), the Ford Focus Electric "loses none of the dynamics and quality of driving a traditional car". They are saying that the Focus Electric actually drives BETTER than the gasoline Focus. They both share premium components and features, but Ford claims the electric vehicle has distinct efficencies and a unqiue and exciting driving experience. I guess that's what you get when you try to shoehorn an electric vehicle into an existing platform - useable space taken up by batteries. With the Leaf and an EV specific chassis they were able to build it with abttery placement in mind and came out with more useable space. I wonder if this is Ford's final battery placement for the Focus Electric or if they'll move them (or some of them) from the trunk when it does finally go to production? Is there room enough left for grocery bags? That's fundamental. Looks like there should be room for groceries, unless you're like my wife and take 1 shopping trip every couple months and really makes it worth her while! She'd need an electric vehicle like the F150 to haul it all! If that's the trunk battery pack in a Ford Focus Electric, then what is this picture of? Is this the same batteries from a different angle? Perhaps with the rear seat taken out? I'd say the picture in the first post is of the Ford Focus Electric prototype models - the same kind Jay Leno got for his green car challenge. The last picture is of the production Ford Focus Electric - a much nicer battery enclosure. The first one looks like a wood box with grey carpet over it, where the last picture looks like plastic molded and fancy! 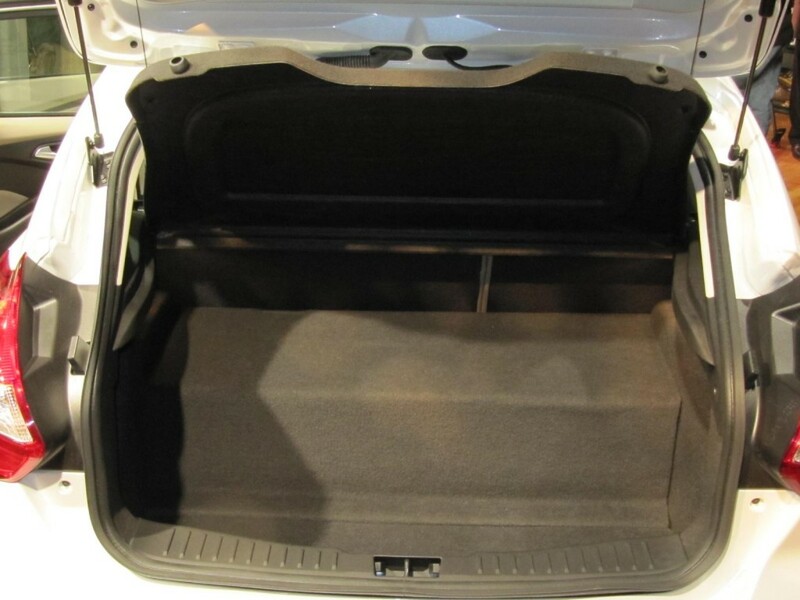 The last picture of the Focus Electric trunk with battery pack looks like the battery box takes up more space than in the prototype version? THe prototype Ford Focus Electric looks like it has space behind the battery pack as well as on top, where the production version only has space above the battery pack - the battery box looks to take up the whole lower level of the trunk compartment? And how do you get to the spare tire? Or is it underneath the car? I'm not sure how you would get to the spare tire, although the Nissan Leaf doesn't have a spare tire, so I'd doubt that the Ford Focus Electric will even come with a spare! In that case it won't matter if there appears to be no space for it in the trunk!